UPDATE: The DARK SHADOWS audio "Blood & Fire" is now on sale at Big Finish for 50% off. You can find the sale at https://www.bigfinish.com/news/v/dark-shadows---blood-and-fire-scribe-award-winner. The 50th anniversary DARK SHADOWS audio "Blood & Fire" was named "Best Audio" of 2016 by the SCRIBE Awards. The Scribe Awards are presented by the International Association of Media Tie-In Writers to recognize licensed works that "tie in" with other media such as television, movies, gaming or comic books. This year's winners were announced last weekend at San Diego Comic-Con. 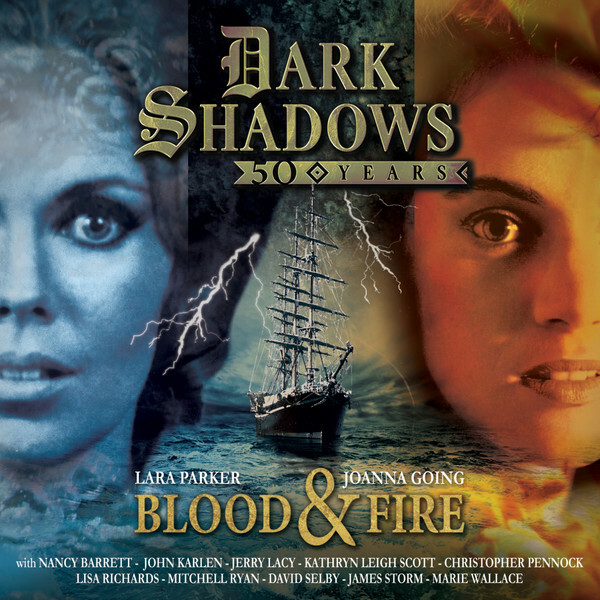 Released last summer in time for the DARK SHADOWS 50th anniversary celebration in Tarrytown, New York, "Blood & Fire" reveals how Laura Murdoch Stockbridge first came to plague the Collins family, and how a battle between her and the witch Angelique almost derailed the entire line. The double-length installment features an impressive cross section of actors representing much of the DARK SHADOWS legacy, including a return by one-time "Victoria Winters" Joanna Going. Gill faced stiff competition in this year's SCRIBE awards, as well. "Blood & Fire" was competing against a DOCTOR WHO audio, "Mouthless," and two TORCHWOOD tales, "Uncanny Valley" and "Broken," the latter of which was written by our own Joseph Lidster. You can get "Blood & Fire" on CD or MP3 directly from Big Finish HERE, or on CD from Amazon HERE.